Eva Hardie, who led Houghton Harriers to bronze medals. North East athletes came away from the Northern Cross Country Championships at Pontefract Racecourse on Saturday with a bag full of medals. With underfoot conditions soft to firm on the undulating course, they galloped to success in most of the 10 events on the programme. And among the medallists was Houghton Harriers’ Under-17 Women’s team with their well earned team bronze medals. They finished just five points behind second club Darlington, who had the winner of the race in India Pentland (17.17). It was the inform Eva Hardy who led the Houghton quartet home (19.24) to the rousing cheers of the club’s supporters. Then came Lydia James in 27th (19.28), Anna Pigford 30th (19.32) and the fourth and final counter was Lara Greggs in 73rd (21.26). There were other fine performances from Houghton’s Brandon Pye in finishing sixth and only two seconds from first place in the Under-13 Boys’ race. The improving Cameron Allan took eighth position (26.26) in the Junior Men’s Under-20 race. He was one place and two seconds behind his former clubmate Alex Brown, now with Morpeth, who had Rory Leonard as the winner (25.41). And Henry Johnson, a first year in the Under-17s, took 17th position (20.21) in the event won by Wallsend’s Sam Charlton (19.13) with Morpeth taking the team title. In a great day for Morpeth, they also provided the winner of the women’s race with their Scottish member Mhairi Maclennan retaining her title in 34.48, just one second ahead of Leigh Harrier Lauren Heyes. Sunderland Harrier Alice Smith had a good run to finish fifth North East runner in 45th (31.49) behind Morpeth’ Emma Holt 24th (30.20), Jarrow and Hebburn’s Georgia Campbell 31st (30.49), Morpeth’s Catriona MacDonald 39th (31.10) and Heaton’s Danelle Smythe 40th (31.18). 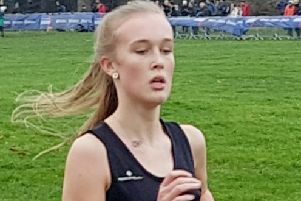 Sunderland also had Gemma Frost in 79th (33.34) and Jenna Wilkinson 84th (33.52), but they lost out on a possible best ever team placing after injury ruled out Vicky Haswell before the start. 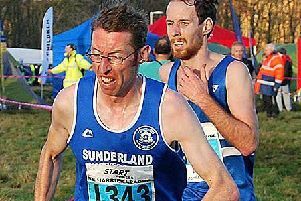 The Senior Men’s race saw all three local clubs, Sunderland Harriers, Houghton Harriers and Sunderland Strollers, all finish teams in the championship for the first time. And it was the Strollers that came out on top in finishing a very creditable 24th through good team management in getting all their top men out onto the start line. They were Mark Anderson in 143rd, John Cook 227th, Jamie Collin 295th, Chris Dwyer 304th, Andrew Duke 324th and Ken Maynard 350th. Houghton finished a team for the first time in years and they were rewarded with 32nd position. They were led home by Lee Dover in 101st, followed by Rory Graham 266th, Steven Johnson 379th, Tom Atkinson 444th, David Gribben 450th and David Coulson 466th. Sunderland Harriers failed to get any of their leading men to travel to Pontefract and they suffered through their apathy. They closed in 36th with Steve Rankin 151st, Graeme Pullan 276th, Paul Redman 343rd, Darren Stoker 404th, Dave Lash 464th’ and Jimmy Johnson 563rd. The race was won by Leeds City athlete Emile Cairiess (38.05) from Morpeth’s Carl Avery (38.14). Former Sunderland Harrier Jack Martin was fourth (38.49). Sale won the team title. Birtley had Kate Waugh in fourth in the Under-20 Women’s race and Chris Perkins fifth in the Under-15 Boys.